After spending some thirty years as an unofficial artist behind the Iron Curtain, Ilya Kabakov first came to the attention of the West in the 1980s. Today Kabakov, who is known as ‘The father of Moscow Conceptualism’, is seen to be one of the most important Russian artists to have emerged in the late 20th century. Alternating between light-hearted irony and genuine tragedy, Kabakov’s work often evokes a shadowy world in which fable-like miracles might occur. Together with his wife Emilia, Kabakov has created installations which imaginatively transform a given space in a way that requires the visitor’s total involvement. Now living in the West, the Kabakovs’ earlier concern with individual freedom in a totalitarian context has developed into a wider concern about the mental and psychological well being of the individual in an unfriendly environment. In their work, the key to health is the imagination. The ‘Mysterious Exhibition’ is one of two rooms from an installation owned by the Museum. 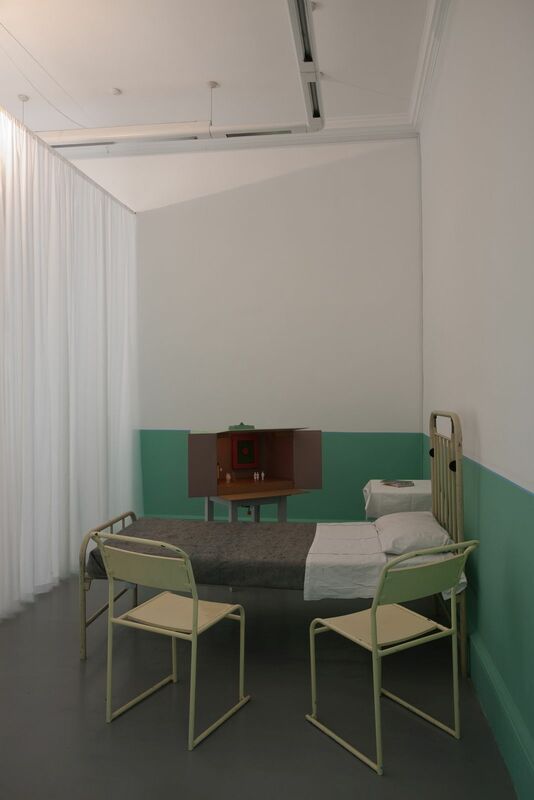 These rooms were purchased from a larger installation, ‘The Children’s Hospital’, a project specifically created for the Museum in 1998 and inspired by the previous history of the building as a hospital for retired soldiers. In this work, little mechanical theatrical dramas invite the child patient to interact in a creative way by completing or adding to the story himself/herself. In this way, children could exchange their theatres with other children in the ward allowing them to benefit therapeutically from the imaginative transformation of their often bleak, enclosed environment.